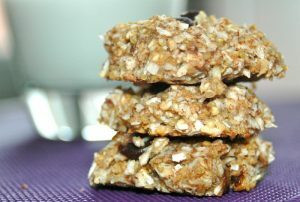 Or even quinoa cookies for me and Thomas. 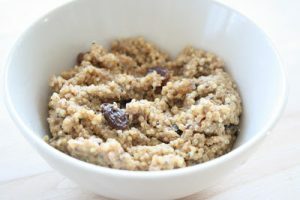 Whenever I do whip up a pot of quinoa for whatever purpose, I always end up making way more than required with the idea that, “Ohh, I’ll just make extra and use the leftovers for something else!” Unfortunately, that tupperwear container oftentimes gets pushed to the back of the fridge, never to be consumed, despite my good quinoa intentions. While taking it easy on the treadmill a couple of weeks ago (walking preggo hill climbs, baby! 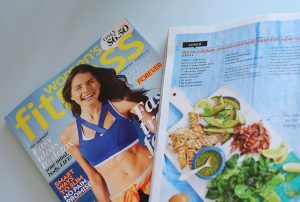 ), I was flipping through one of my favourite magazines, Women’s Fitness Australia. They always have amazing and simple recipe ideas. Side note: for some reason, they are ceasing future publications from October onwards and from what I’ve seen on social media, there are a lot of unhappy fitness enthusiasts here in Oz. Seriously, you guys! I am so disappointed! 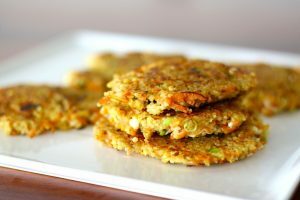 One idea that I came across while reading a page dedicated to ‘simple lunchtime snacks’ were zucchini quinoa fritters simply using grated zucchini, cooked quinoa and egg. 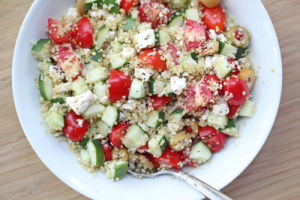 Another idea to add to the leftover quinoa repertoire? I think so. I didn’t have zucchini at home, so decided to use carrots. 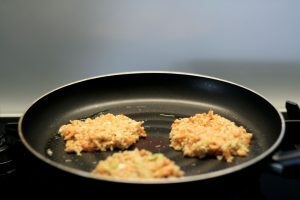 To be honest, I found these fritters to be pretty bland, so recreated them a second time with a few more ingredients to add some extra flavour. Much better! 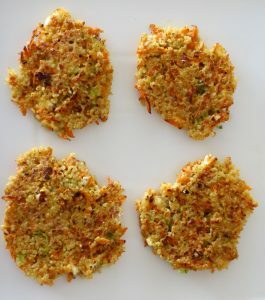 These fritters are tasty on their own, or even crumbled over salad greens for an extra boost! 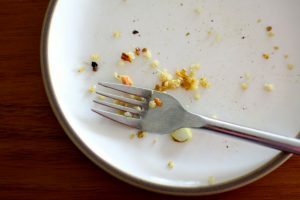 They might even go so far as to trick your brain that you’re eating potato hash browns, although your insides will likely be much happier with this version. 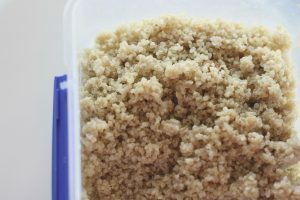 Cook quinoa to package instructions. 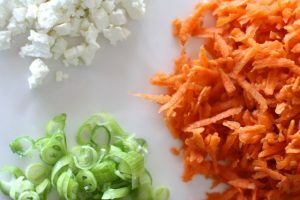 Grate carrots and drain/squeeze as much water from them as possible. 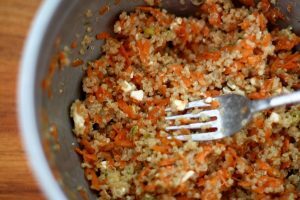 In a large mixing bowl, combine quinoa, carrots, feta, green onion, followed by spices. Add in eggs and combine thoroughly. Add 1/2 tbsp oil to skillet on medium heat. Form 3 large, 1/2″ high fritters, just as you would a pancake. Grill about 4-5 minutes per side, or until crispy. Repeat a second time with remaining ingredients. Optional: Using 3 eggs will allow fritter to hold its shape a bit better, but also makes it a bit more ‘chewy’. What’s your favourite way to incorporate quinoa into daily meals? Any amazing recipes I should try?